One of three co-founders of Washington-based American Tug, Kurt Dilworth caught the boatbuilding bug early. As a high schooler, he was working in the shoproom—“pushing a broom”—at a friend’s Pacific Northwest plant when Kurt was asked if he could assist on a project that no one in the building could handle. 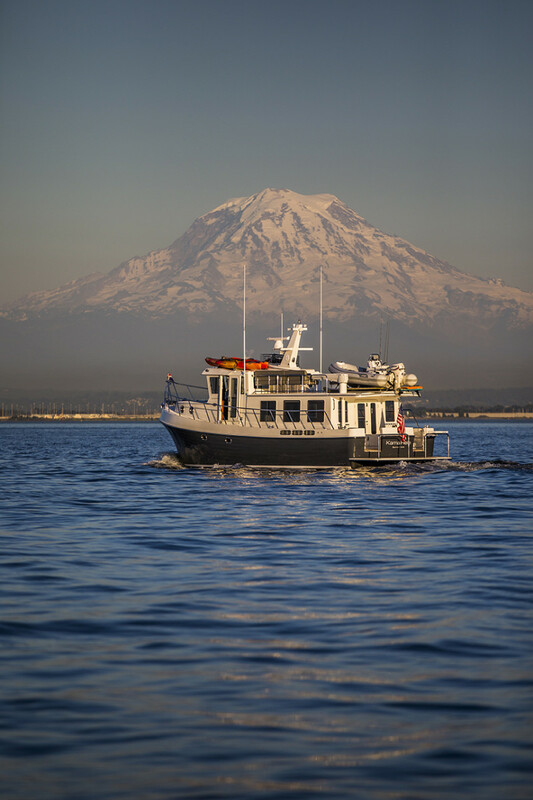 Kurt would go on to get a degree in mechanical engineering from the University of Washington, and after graduating took a job at Nordic Tugs based on a recommendation from a friend, boat designer Lynn Senour. At Nordic, he would meet the future of American Tug in colleagues and friends, Tom Nelson and Mike Schoppert. The three would eventually leave Nordic’s management team in 1999 to start the Tomco Marine Group the following year. One constant between the two companies was Senour, the self-taught naval architect responsible for a number of designs, including successes in both the Nordic and American Tug lines. Senour died in 2004 at the age of 89, but his designs achieved remarkable success given his lack of formal education in the field: his first American Tug launch was the 34. Some will know it as the 34, and others will recognize it as a “365” after a decision to designate lines based on overall length. In any case, Senour’s 365 design, combined with an economic build, set the fledgling company on solid footing: The company would end up building over 200 of the introductory model. 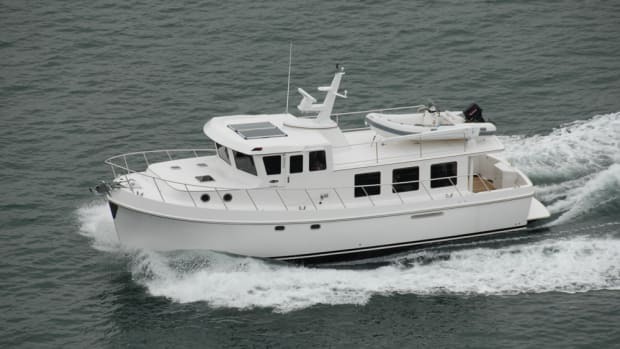 "The 485 isn’t a Lynn Senour design, but it certainly drew inspiration from his and company founders’ American Tug concept, with an emphasis on comfortable cruising and flexibility within the framework of a true semi-displacement hull..."
Though the 365 is still available today, Kurt says that fewer people are interested in the smaller boat because most of their owners cruise for longer periods, often up to three months at a time. Many others choose to live aboard, and in those cases, accommodations spaces, home offices, galley configurations, refrigerator space, and stowage become primary concerns. Acknowledging this, the decision was made to grow with the 2004 release of the soon-to-be-successful 435 (a 41-footer if you go by molded length), and a few years later, bigger still with the release of the 485 (45 feet on deck). The 485 isn’t a Lynn Senour design, but it certainly drew inspiration from his and company founders’ American Tug concept, with an emphasis on comfortable cruising and flexibility within the framework of a true semi-displacement hull, featuring rocker from bow to stern. All the designs have hard-chines, a full keel meant to run efficiently at hull speeds between 7.5 and 8 knots. At these modest speeds, they commonly burn a cruiser-friendly 3.5 gallons per hour across the entire model range, with 15-16 knots available with a more expensive fuel bill. 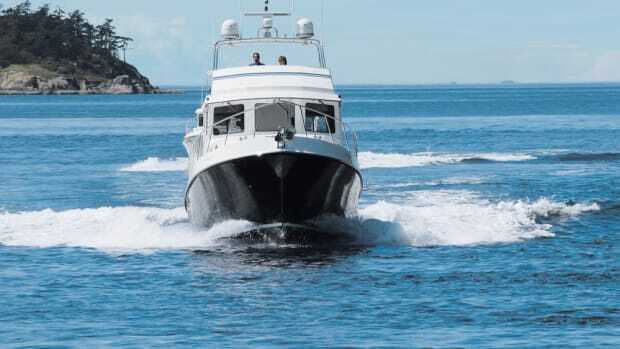 Like many modern trawler-style yachts built today, this power flexibility gives owners the best of both worlds: some speed when it’s needed, and great fuel economy for the majority of the engine’s life. 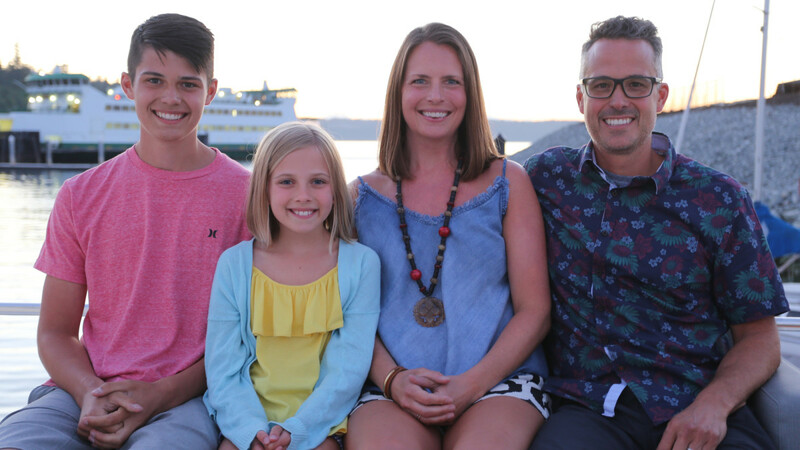 Like Kurt, Chris and Julie Heyer, from Sumner, Washington, also realized that boats were always going to play an important role in their lives. 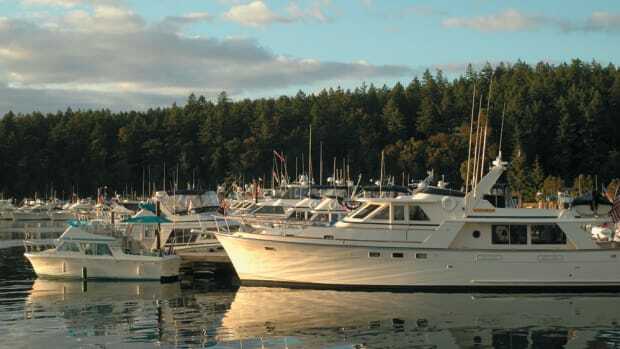 With mutual affection for the water, they acquired a Camano 28 when their first, Skylar, was a baby. 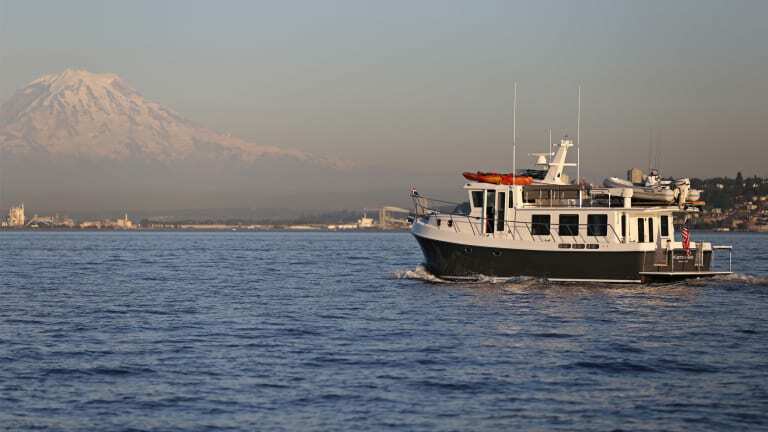 They cruised the Camano extensively, from Puget Sound north to the San Juans, Gulf Islands, and Desolation Sound. The small boat worked perfectly for everything they needed. “Skylar was really raised on that boat,” says the couple, but the birth of their daughter, Ava, forced them to re-evaluate space and amenities on board. “We’d never really been bothered by having a solar shower in the cockpit, no generator, and no watermaker,” Chris says. The Heyer family on the flybridge. 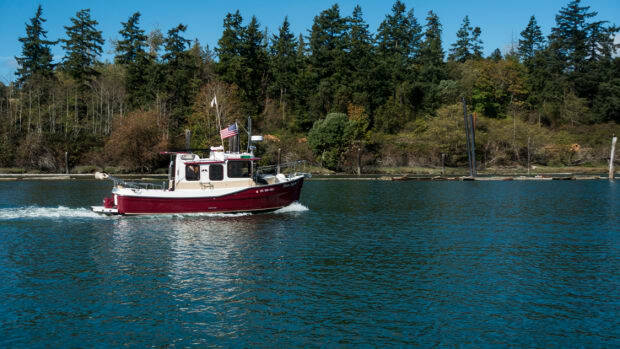 But as the kids grew older—they are now 9 and 16—even the used American Tug 365 started to become tight on space for the amount of time they spent cruising, particularly in the summers when school was out for the year. So, the discussion started a few years ago between the Heyers and Kurt to build their own 485. 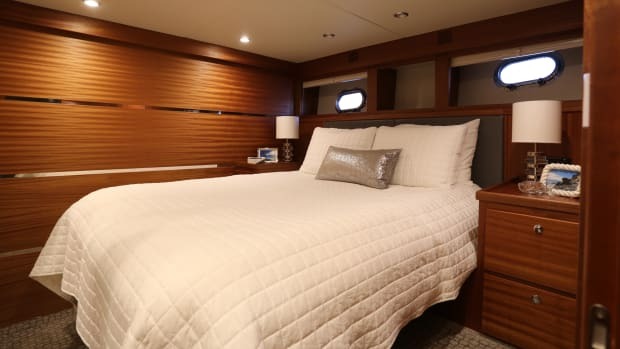 They loved their 365, but what sold them on a new build was Kurt’s willingness to work with them to change a number of standard items, thus catering the build to their cruising needs. Kama Hele in south Puget Sound with Mount Rainier in the distance. They wanted the boat to be as simple as possible so that they could operate it easily, quickly drop the hook, and put the tender, kayaks, and assorted toys in the water. This led to the first significant change from the standard model. Instead of a single fiberglass door leading to the swim platform, they asked Kurt to not only build a deeper, 48-inch swim platform, but two transom doors that could access it from either side of the cockpit. Furthermore, if their children were swimming off the back, they preferred the improved visibility of stainless gate-type doors over solid FRP. 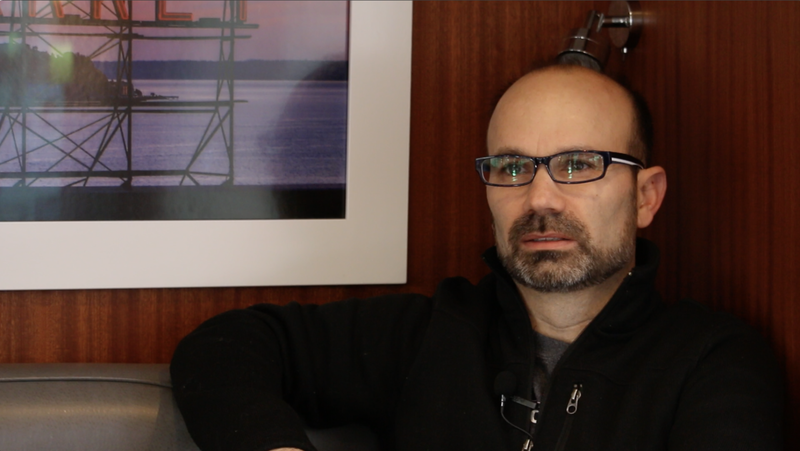 From a systems perspective, Chris and Julie also wanted to significantly increase the boat’s cold storage capacity. In addition to twin drawer freezers and a drawer-style fridge in the galley, they have another full-size fridge in the galley and added a chest freezer in the engine room. Updates were also made to the interior design, with contemporary right angles on the trim rather than the more traditional radiused joinery. Stainless accents, art tile, and mirrors open the space and keep it fresh and clean yet always maintaining the DNA of a boat, not a condo. These changes announce their impact as soon as you step into the saloon. 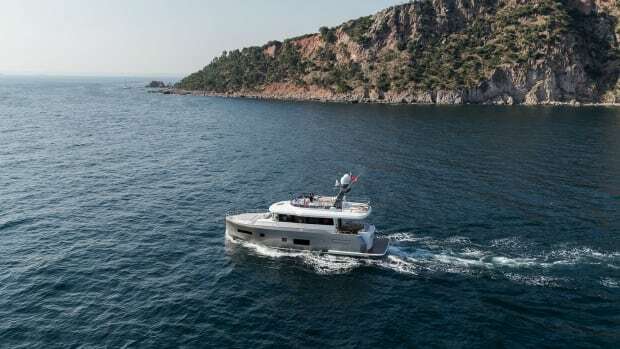 Natural light bathes the open saloon, U-shape galley, and raised pilothouse. Comfortable spaces cater to lounging and dining. A family of this size could easily make use of the dinette to starboard of the galley, or, while running, the table abaft the helm. Although the Heyers aren’t speed demons, they asked Kurt what could be done to achieve a few extra knots. He came back with a few suggestions: This boat was built with extra-light ply in the cabinetry and non-structural bulkheads in order to save weight. 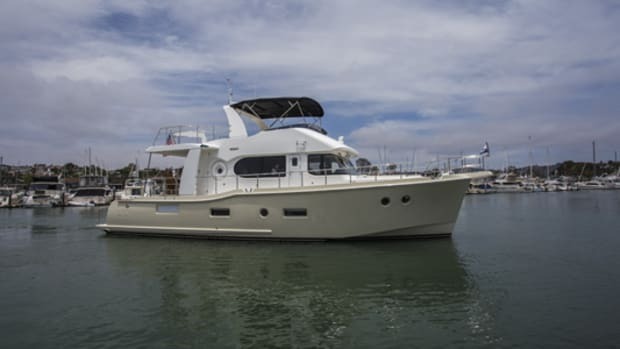 Extra power was added to the boat to give it a 14-knot cruise with a top speed around 18 knots with a full load, including a heavy 13-foot tender on the flybridge.” The Heyers are a younger couple, still working full time, so the opportunity to power up and make the most of their time at sea wasn’t a place where they were willing to compromise. 485, hull six, was delivered to the Heyers in Tacoma over a year ago. Chris and Julie christened her Kama Hele, Hawaiian for “traveler.” Since the age of 12, Skylar has channeled this adventurous spirit toward his own version of independence. When they arrive in certain anchorages, he will load up his tent and camping supplies in one of the kayaks, paddle to shore, and overnight by himself while his sister gets a night off from being a sibling. All in all, not a bad way to grow up.